29th June 2004: Epson New Zealand has announced the release of the Epson PictureMate™ personal photo lab, a new concept, portable, all-in-one photo processing centre for digital camera and compatible mobile phone users to make affordable, long lasting and high quality photographs on the run without using a PC. 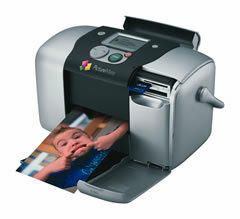 PictureMate's innovative one-touch technology makes 100x150mm photos directly from digital cameras at an affordable price - less than 60c cents per picture - and Epson's 6 colour UltraChrome Hi-Gloss™ inks and photo papers ensure photos last for many family generations - even centuries. When displayed, PictureMate photos resist fading for as much as 2 to 4 times longer than the leading photo lab brands, and from 4 to 20 times longer than other dedicated 100x150mm photo printers. PictureMate photos last approximately 200 years in a photo album and up to 100 years when displayed in a glass frame. They are also water and smudge resistant for worry free handling. One touch print options such as printing in black and white or sepia allow users to print photos to suit their personal needs and taste. The PictureMate is so resourceful it can also print proof sheets, crop photos, add classic borders and make wallet sized photos. PictureMate consumables are available in Epson's Print Pack which includes a six colour photo ink cartridge and glossy photo paper for 100 photos (100x150mm) - all conveniently packaged together. An optional Bluetooth wireless module may be used to print photos from Bluetooth capable mobile phones to meet the needs of today's busy lifestyle. Not only is making photos easy with PictureMate, but filing photo collections is too. Without a PC and with just one button, PictureMate enables users to automatically back up digital images from the camera memory card directly to externally-connected devices, including CD-R and ZIP™ drives. PictureMate is PictBridge compatible, which means that each photo is automatically optimised for colour and quality as it passes from the digital camera to PictureMate. PictureMate is compatible with most digital cameras, supporting all popular memory card formats including SD™ memory card/MultiMediaCard™, Memory Stick ®, Compact Flash™ Type I and II, SmartMedia™, Secure Digital, MMC, xD and Microdrive. Epson's Advanced MicroPiezo™ print head technology and 6-colour pigment ink ensures that photos can last for up to 100 years when cased in a glass frame or 200 years in a photo album. PictureMate also reproduces the finest detail from high resolution images, delivering up to 5760 x 1440 optimised microscopic 2.5 picolitre droplets per inch for the clearest detail and smooth colour gradations. PictureMate is compatible with both Microsoft and Apple computer operating systems. Using the PictureMate cartridge and PictureMate paper, prints can last up to 200 years in archival sleeves in album storage and up to 100 years in a glass frame in indoor display conditions. See www.wilhelm-research.com for test conditions. Actual print stability will vary according to image and storage or display conditions. Epson does not guarantee the longevity of prints. For information on lightfastness criteria and results refer to www.epson.co.nz or www.wilhelm-research.com.